1. Know and respect who your dog is before you bring them to a dog park. Does your dog enjoy interacting with all sorts of other dogs? Is he or she even-tempered when excited? Is she respectful of other dogs—will she back off if the other dog disengages? Is your dog over six months (please don’t take younger pups to dog parks!) and trained well enough that he or she will come to you when called? If yes, your dog may be a good dog park candidate. As someone who has been observing dogs and dog play for the last 20 years, I’d guestimate that only about 50 percent of adolescent dogs are good dog park candidates, and probably only about 20 percent of adult dogs will truly enjoy the dog park experience. There is nothing wrong with a dog that isn’t right for the dog park. Dog parks are a little like going to a heavy metal concert—some of us love it and others would rather stay home and read a good book. (And it doesn’t mean that your dog can’t still enjoy other dogs—see number 10 below for more ideas about alternative dog-to-dog experiences). 3. Once you decide to go into the park, stay committed to your dog. Move around the park with your dog—don’t sit or stand in one place. This will help your dog learn to move in and out of the interactions with other dogs. Watch the play and engage with your dog frequently. Call him to you often so that you stay connected. 4. Don’t hang out near the entrance, and help your dog to not crowd others as they come into the park. The entrances of dog parks are where many problems happen. 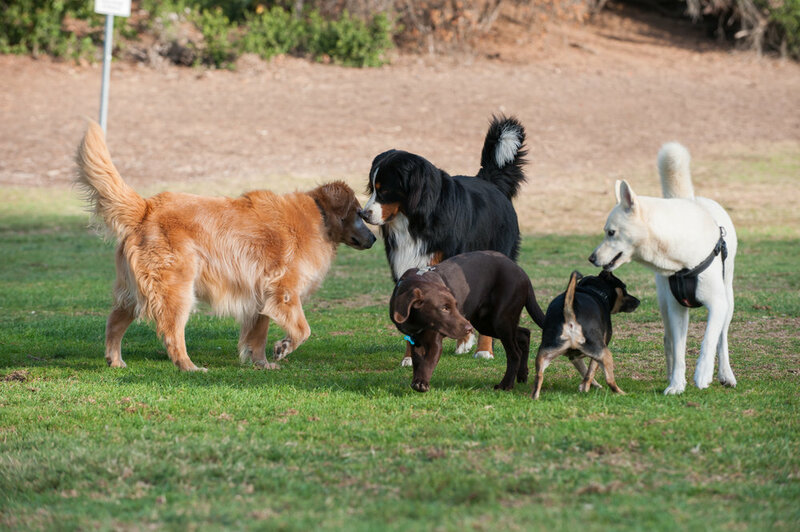 Dogs should be discouraged from crowding new dogs coming into the park. When you see a new dog coming in, call your dog to you, and move them away from the entrance. 5. Interrupt excited dog play frequently. If the dogs aren’t taking frequent breaks in play, help them out by calling them to you and interacting with them for a few minutes before having them go back out to play again. These frequent breaks will help prevent fights that arise from overexcitement. 6. If your dog is behaving inappropriately—being too rough or disrespectful or even bullying another dog—stop the play immediately. Call your dog to you. Sometimes a short break will be enough to calm things down, but often it is better to move along. 7. If your dog is uncomfortable, protect him! Leave if you need to. Don’t expect your dog to simply “work it out” if another dog is doing something that is making your dog uncomfortable. Even if the other dog is just playing. Your dog needs to trust that you will take care of him. 8. If your dog gets into a conflict (it happens sometimes, even with dogs that are good candidates for the dog park), leave for the day. Conflicts or fights cause stress hormones to surge in the dog’s body, and once those hormones are pumping, the chance of a second or worse conflict is much higher. Better safe than sorry. 9. Do not take toys or food into the dog park that your dog may want to guard from other dogs. Guarding behavior is not fun, but it is normal dog behavior. It can also be avoided in most situations. Leave the new highly coveted toys and super high value treats at home. 10. Back to number one—respect who your dog is! Every dog is different and has different social needs and not every dog needs or wants to be in a dog park. If you have a dog that isn’t a dog park candidate, don’t despair. He or she may still have good dog friends. Leash walks with pals can be great for some dogs. Play dates in a back yard can be a blast for puppies and younger dogs! Off leash beach walks and hikes through the woods may be a better match for many of our dogs. Mardi Richmond runs Good Dog Santa Cruz and is a Certified Professional Dog Trainer and a Certified Behavior Counselor. She has been a student of dog behavior and training for almost 30 years, and has been helping others to train their dogs for about 16 years.